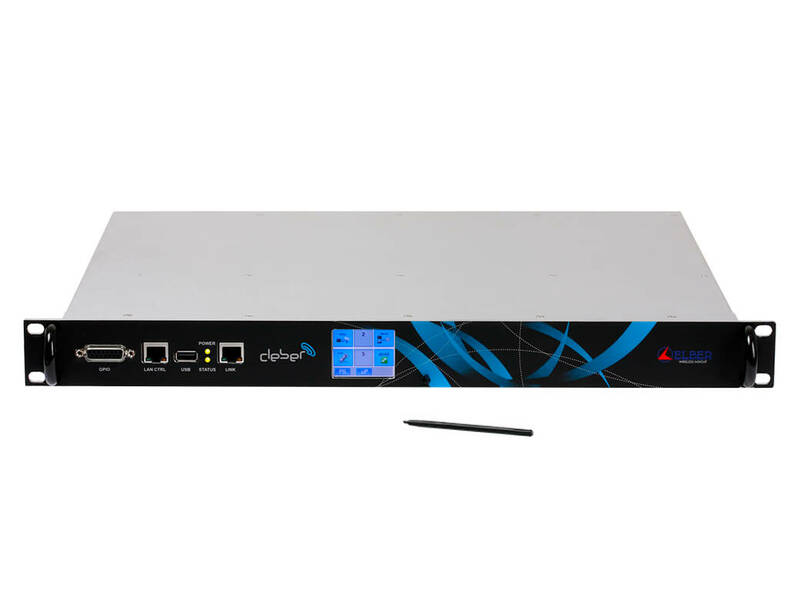 Cleber offers a powerful, flexible and modular hardware and sof¬tware platform for broadcasting and contribution networks, where customers can install up to six boards with no limita¬tions in terms of position and number. Based on a Linux em-bedded OS, it detects the presence of the boards and shows the related control interface to the user, either through web GUI and Touchscreen TFT display. Power supply can be single (AC and/or DC) or dual (hot swappable for redundancy); customer may choose between two ranges for DC sources, that is 22-65 or 10-36 Vdc for site or DSNG applications. Despite Cleber supports any combination of boards, it is possible to describe separately some particular applications, such as gateway from MPX-FM to DVB-ASI. SRS-06 board digitalizes 4 FM-MPX and 4 FM radio channel (88-108 MHz), providing a generic ASI stream suitable for transport through broadcast radio links; it is possible to assign a PID to each channel and also insert a timestamp for coherent conversion of the received signal; furthermore, the optional GPS board let the system generate timestamps synchronized with an absolute 10 MHz reference. In the receiving site, SRS-07 locks the ASI signal and gives back 4 MPX-FM output, as well as a common RF output with up to 8 carriers modulated by each MPX (88-108 MHz range); if equipped with GPS receiver, the system is able to transmit each FM signal with prefixed delay, allowing the synchronization between different stations. Parameters control and monitoring is possible through TFT touchscreen display and web interface or SNMP.